Photographed April 2014 at Hassayampa Preserve, Wickenburg, Maricopa Co., Arizona, USA. Host plant is Fremont Cottonwood (Populus fremontii). A winged adult is suspended from the twig with wings facing down. The other insects are immature psyllid bugs of various ages..
Psyllid bugs, like many kinds of Homopterans, generally occur in colonies. Each is first established by a founding, winged adult, followed by several quick generations that may include parthenogenesis and unwinged adults. 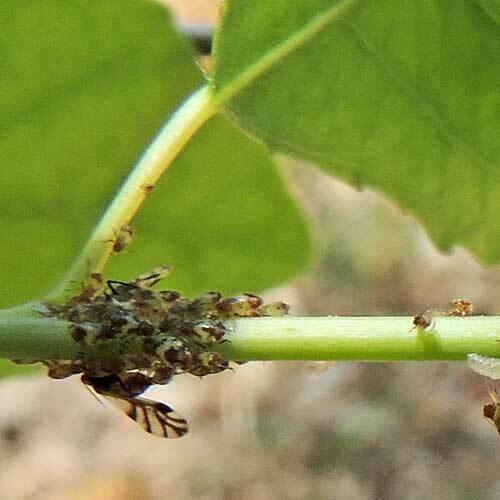 The bugs were releasing honey dew and were attened by Formica ants (thumb link at right) that take the sugary substance and help ward off psyllid predators in return. I noticed several predators working to reach the bugs past the ant guards, including a minute pirate bug, Orius that the ants fought off. Copyright Michael J. Plagens, Page created 22 May 2014.